Evan Bradds and Belmont have dominated the OVC for almost four seasons, but only have one NCAA tournament appearance in that time. While many conferences are preparing for close races in the stretch run, the Ohio Valley is an exception. That’s because Belmont has opened league play 11–0 and, with five regular season games remaining, is 3.5 games above the next closest challenger, Morehead State. At this point, the Bruins seem like a lock to grab the OVC tournament’s No. 1 seed. It’s a familiar spot for Belmont, which has won its regular-season conference title in seven of the last nine years. It hasn’t always translated to a conference tournament championship, however, with the Bruins being stunned by eighth-seeded Austin Peay in the OVC semifinals a year ago and falling in the championship game in 2014. The latter was current senior star Evan Bradds’s freshman year. Counting this season, the Bruins have gone 48–11 in league play over Bradds’s career, but have just one NCAA tournament appearance to show for it. A season ago, Bradds led the country in field-goal percentage (71.7%) as part of a junior season that earned him OVC Player of the Year and AP Honorable Mention All-America honors. This year, he’s been even more of a focal point in Belmont’s offense, and while he’s shooting at a lower percentage (62.2%), he’s averaging 21.2 points, 8.7 rebounds and 2.5 assists per game. The 6' 7" Bradds is the anchor of an offense that leads the country in two-point shooting percentage (62.3%) and is seventh in effective field-goal percentage (57.2%). Most of the Bruins’ inside-the-arc offense runs through Bradds: Per hoop-math.com, he’s taken 44.0% of their shot attempts at the rim and 55.0% of their two-point jumpers. Belmont as a whole is a very experienced team, starting two seniors, two juniors and a sophomore. The Bruins rely heavily on their starters, with the bench only accounting for a quarter of the team’s minutes, one of the lowest percentages in the country. After Bradds, junior forward Amanze Egekeze and senior guard Taylor Barnette (who started his career at Virginia) combine for more than 23 points a game, while junior point guard Austin Luke dishes 7.4 assists per game and is seventh in the country in assist rate. As has been the case in recent years, Belmont takes a lot of three-pointers, getting 40.0% of its points from the arc and just 16.3% from the free-throw line, despite shooting a collective 77.0% from the charity stripe. Egekeze and senior forward Nick Smith are its biggest threats from the perimeter, hitting 42.7% and 44.0% of their threes, respectively. While the Bruins appear to be the clear-cut best team in the Ohio Valley Conference—beyond just their record, they’ve been the OVC’s most efficient team both offensively and defensively—they have a few fatal flaws that could make it difficult to play the role of Cinderella in a potential NCAA tournament appearance. Their inability to get free throws makes them susceptible to falling behind against a team that lives at the line, and they force a low percentage of turnovers and steals. Belmont would likely need to rely on a big game from Bradds and a great shooting night from behind the arc, but even that may not be enough—in a 13-point December loss to Middle Tennessee, a solid team in its own right, Bradds had 21 points and 13 rebounds and the Bruins made 12 of their 29 three-point attempts. Still, there’s something to be said for a mid-major team that has a) a player as talented as Bradds, on his last go-around as a senior, b) the ability to outshoot its opponent and c) several juniors and seniors, including ones who have played in the NCAA tournament before. Belmont will be hoping to avoid a repeat of last season’s unexpected upset in the Ohio Valley tournament, and if the Bruins—currently 66th in both RPI and on kenpom.com—go dancing, they’re one to keep an eye on. A great battle has been shaping up in the Big South this season, with three teams—UNC Ashville, Winthrop and Liberty—currently tied atop the league at 10–2. With just six regular-season games left for each team, every week is critical, but maybe none more so than this one, when the Bulldogs and Eagles meet in Asheville. UNC Asheville already edged Winthrop on the road last month, so the Eagles will be looking to return the favor. Both teams will still face Liberty once more as well, so all three control their own destiny in the hunt for the conference title and top seed for the Big South tournament. Daum was featured under the “Stat of the Week” section a month ago due to his foul-drawing prowess; since then, the talented big man has exploded even further on the way to overtaking Valparaiso’s Alec Peters for second in the nation in scoring (23.8 ppg). Daum poured in a career-high 42 points in 31 minutes in a Jan. 21 win over Fort Wayne—which included hitting 10 of 15 three-point attempts. He then followed it up with 29 points against Denver, 33 against Omaha, 16 against Western Illinois and 38 on Saturday against Oral Roberts. What’s behind the outburst? Those three-pointers. The 6' 9" Daum has always had the ability to hit them—he attempted 65 as a freshman and made 44.6% of them—but prior to that Jan. 21 win he had connected on three or more in a game just seven times in 55 career games. Daum’s 15 attempts from behind the arc against Fort Wayne crushed his career-high, but he’s followed it up by making 5 of 8, 4 of 8, 0 of 5 and 5 of 11 during his next four games. Maybe the big man is just on a hot streak, but he seems to have found a rhythm and has attempted more total threes in his last five games than he had in the previous 10 combined. 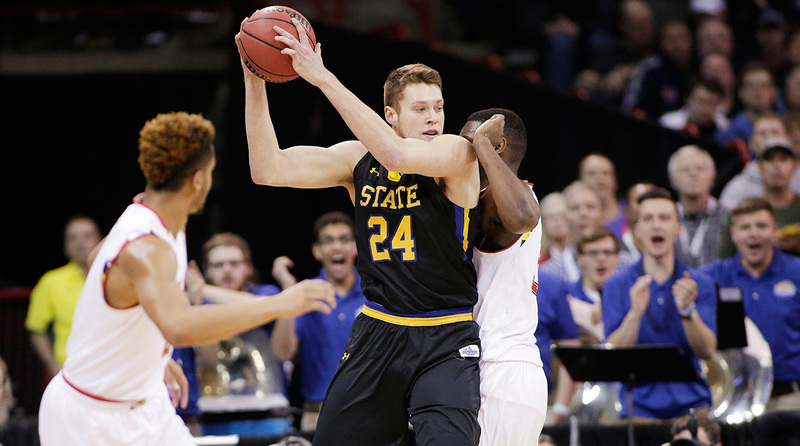 Not many things have gone right this season for 12–14 South Dakota State after its NCAA tournament appearance in 2016, but Daum, who’s even more dangerous inside the paint than outside it, is worth the price of admission. UNC Wilmington sophomore forward Devontae Cacok is doing something pretty extraordinary this season. Twenty-five games in, he’s shooting nearly 80% from the floor, while attempting 7.4 field goals per game. Per Sports-Reference, since the 1992–93 season, the highest field-goal percentage a qualified player (minimum five field goals per game and having appeared in 75% of a school’s games) finished with was 71.2%, set by Belmont’s Bradds last year. The Seahawks have six regular season games left, plus the CAA tournament and any potential postseason berths. Cook is currently in line to smash this record. Were it not for Cook, Central Florida’s 7' 6" center Tacko Fall (74.7% field-goal percentage) would be the one looking ready to break the mark; and yet, Cook currently is 4.6% above Fall’s impressive percentage.